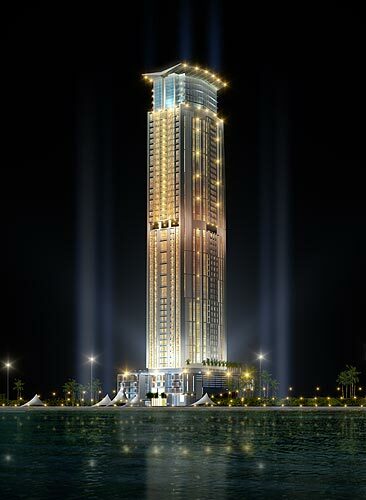 The Marina Heights tower stands tall amongst the world’s finest residential developments. Spanning just 57 floors, Marina Heights provides a truly unique mix of two, three, and four bedroom apartments, and includes a number of duplex designs on the upper floors. Surmounting them all are ten superlative penthouses, each with panoramic views on three sides, and equally astonishing space within. From the outset, Marina Heights was conceived to be exceptional – exceptional in design, exceptional in construction, exceptional in accommodation and finish. Marina Heights is located in Dubai Marina, near the Internet City and Media City. Emirates Hills and The Montgomery Golf courses are just a few minutes drive away, and the buzz and lifestyle of Dubai Marina are at your doorstep. Dubai’s International Financial Centre is reached in 15 minutes, and the International Airport is only a further 10. Shiekh Zayed Road offers fast access to the powerhouse of Jebel Ali Free Zone, and Dubai’s superlative shopping and fine restaurants and hotels are all easily reached.